Early last year, a group of knowledgeable Super Smash Bros. Melee enthusiasts known as Melee Stats banded together to create a podcast dedicated to the discussion of all things Melee. 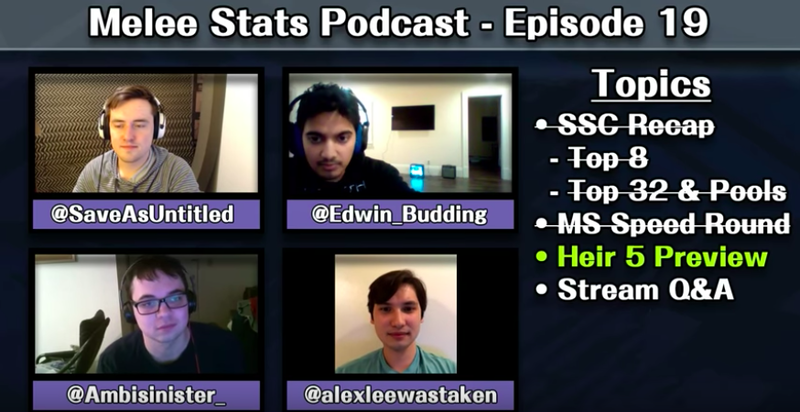 Thanks to the group’s experience seeding majors, the Melee Stats Podcast was able to establish itself within a unique niche, convening every week to discuss rankings, hidden bosses, and up-and-coming players largely unknown to the national scene. But all good things must come to an end. Thus, tonight’s episode marks the start of an indefinite hiatus for the Melee Stats Podcast. Headed by writer Anokh “Edwin Budding” Palakurthi and video creator Scott “SaveAsUntitled” Schroeder, the Melee Stats Podcast featured a rotating cast of guests from every corner of the Smash community, including other members of Melee Stats, top players, tournament organizers, infamous stream monsters, and yours truly. With such a wide variety of personalities in play, the Melee Stats Podcast was occasionally a focal point for controversy. The infamous beef between Bobby “Scar” Scarnewman and Josh “Fendrick Lamar” Fendrick came to a boiling point when Fendrick Lamar claimed during an episode of the podcast that he’d easily defeat Scar, while another episode pushed William “Trulliam” Truong to admit that his crewmate Vikram “Nightmare” Singh had been involved in a case of sexual misconduct, leading to the latter’s ban from the competitive Smash scene. But most of the time, the Melee Stats Podcast was a lighthearted celebration of the nerdier side of Melee, a display of obscure knowledge and sincere interest in minutia that provided a refreshing take on events within the Smash community. “Its funny how much I enjoy listening to this, even though I, as a casual melee spectator, basically don't know who any of these players you talk about are haha,” enthused one YouTube commenter underneath a recent episode. From its guests’ odd preoccupation with Daniel “Zamu” Bernstein, to its weekly “speed round,” to the amusingly repetitive Fox vs. Marth bickering between hosts Edwin Budding and Eryk “Ambisinister” Banatt, the Melee Stats Podcast was full of pleasant idiosyncrasies that have made the podcast eminently re-listenable. Surface-level fans of the competitive scene may not always have understood the more obscure references made by members of the podcast, but the amusing characters that the show brought on stream each week made it entertaining to anyone with an interest in Melee. Melee Stats superfans need not fret; the organization isn’t gone for good. Melee Stats plans to continue putting out articles, researching regional scouting reports, and recording the occasional “deep dive” podcast, all of which will be available on the group’s website. And there are still plenty of other Melee podcasts out there, such as Analog, for fans of the game looking to spice up their daily commute. The Melee Stats Podcast might be dead, but Melee, as always, lives on.